ST. PETERSBURG, Fla. (April 16, 2019) -- Tampa Bay Rowdies goalkeeper John McCarthy was named to the USL Championship Team of the Week on Tuesday for his performance in Saturday's match against Louisville City FC. McCarthy made a season-high seven saves to keep the Rowdies in the match. GK – John McCarthy, Tampa Bay Rowdies: McCarthy posted an outstanding seven-save performance to keep the Tampa Bay Rowdies undefeated after a 1-1 draw with Louisville City FC at Al Lang Stadium. D – Wesly Decas, ATL UTD 2: Decas registered 18 clearances and 12 recoveries, won 25 of 31 duels and completed 71 of 86 passes to help Atlanta to a pair of victories against Memphis and North Carolina. D – A.J. Cochran, Phoenix Rising FC: Cochran made four interceptions, eight recoveries, won 5 of 7 duels and recorded an assist as Rising FC took its first win of the season against El Paso Locomotive FC. 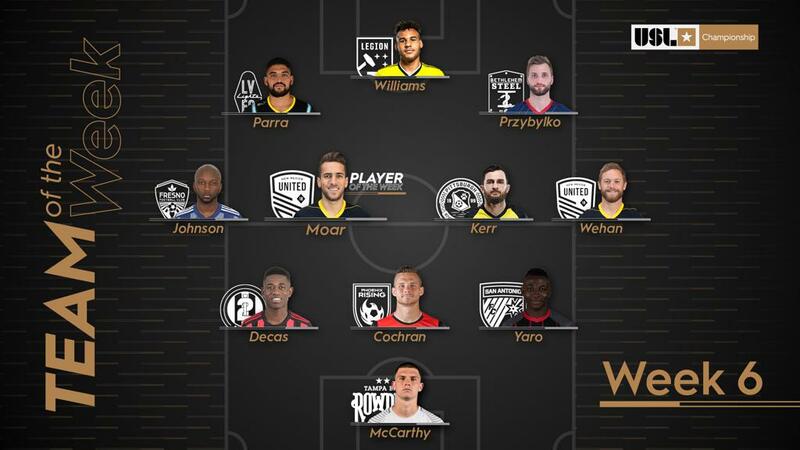 D – Josh Yaro, San Antonio FC: Yaro recorded a team-high nine clearances while also winning 4 of 5 duels and notching seven recoveries in SAFC’s 2-0 victory against the LA Galaxy II. M – Jemal Johnson, Fresno FC: Johnson had a pair of goals as the Foxes continued their undefeated start to the season with a 3-1 victory against Tulsa Roughnecks FC at Chukchansi Park. M – Santi Moar, New Mexico United: Moar’s first-half hat trick kept New Mexico’s undefeated start rolling in a 5-1 win against Real Monarchs SLC in front of 12,327 fans at Isotopes Park. M – Kevin Kerr, Pittsburgh Riverhounds SC: Kerr scored the game-winning goal and notched an assist as the Hounds took a 3-1 victory against Hartford Athletic before a regular-season record crowd of 5,182 fans. M – Chris Wehan, New Mexico United: Wehan had one goal and two assists and finished the night with five key passes while completing 22 of 26 passes overall in New Mexico’s 5-1 win against Real Monarchs SLC. F – Irvin Parra, Las Vegas Lights FC: Parra recorded a hat trick as Las Vegas romped to a 5-0 victory against Tacoma Defiance in front of 7,805 fans at Cashman Field on Saturday night. F – J.J. Williams, Birmingham Legion FC: Williams scored twice after coming off the bench to make his Legion FC debut and helped the visitors hand Saint Louis FC its first loss of the season in a 3-2 win. F – Kacper Przybylko, Bethlehem Steel FC: Przybylko scored a pair of goals, completed 19 of 22 passes and recorded two key passes as Steel FC took a 3-1 victory against the Charleston Battery.